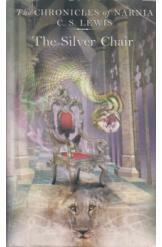 The Silver Chair by CS Lewis, Sci Fi. Jill and Eustace are rescued from their dreary new high school by the magical lion Aslan, who brings them back to Narnia for another vital mission. Prince Rilian has gone missing, and it is up to the two teenagers - as well as a morose marsh-wiggle named Puddleglum - to find an rescue the lost heir. Their journey will take them beyond the safe borders of Narnia and through the lands of giants, monsters, and the malevolent Lady of the Green Kirtle. Part of the Chronicles of Narnia series.